Invented in the 50’s by R. Buckminster Fuller, the geodesic dome is still the lightest, strongest, and most cost-effective structure ever devised. The geodesic dome is able to cover more space without internal supports than any other enclosure. It becomes proportionally lighter and stronger the larger it is. 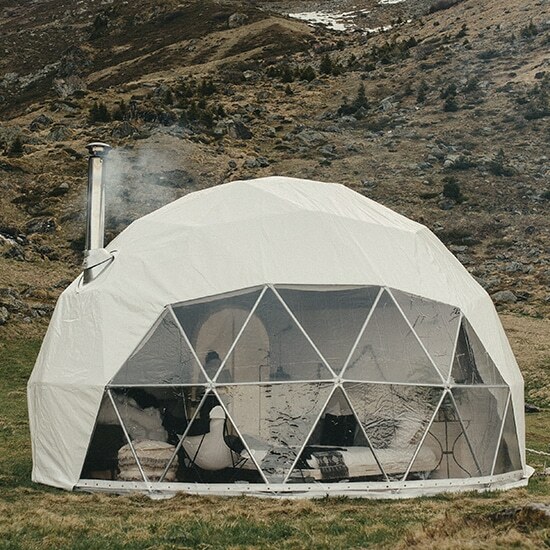 Based on this concept, easy to build construction and energy efficient, the dome tent combines the inherent stability of triangles with the advantageous volume-to-surface-area ratio of a sphere.